Gabriel Ricardo Nemogá Soto is a descendent of the Muisca Indigenous People of Colombia, South America. He has a PhD in Human Ecology (University of California-Davis), a MA in Socio-Legal Studies (Brunel, UK), a BA in Sociology (National University of Colombia), and a BA in Law (Free University of Colombia). Dr. Nemogá has conducted field and community participatory work with Indigenous peoples and organizations in Colombia, the Andean and Amazon region, and Mexico. His research interest covers Biodiversity Law, Protection of Traditional Knowledge Systems, Indigenous education, and Indigenous rights and economic development. Dr. Nemogá's work strives for the incorporation of indigenous worldviews and ways of life, normally ignored in decision-making processes, in the development mechanisms for the protection of traditional knowledge and biodiversity. He also sees Indigenous education as a critical step to exercise indigenous self-determination and to ensure the respect towards a culturally distinct ways of life. Dr. Nemogá previously was an associate professor at the National University of Colombia where he founded the Institute of Socio-Legal Research (UNIJUS), the research group on Policy and Legislation on Biodiversity, Genetic Resources and Traditional Knowledge (PLEBIO), and the Master Program in Bioscience and Law, among other initiatives. His published works in articles, chapter books, and public presentations encompass ethical and legal issues on human genetic research, bioprospecting, property rights and biodiversity, protection of traditional knowledge, Indigenous education and relationships between modern states and Indigenous nations. He has been involved in research initiatives undertaken with the research group PLEBIO, the International Union for the Conservation of Nature, South (IUCN-South) and research partners from Central and South America. 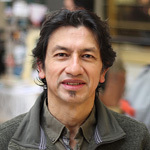 He has been involved in leading research initiatives on bioprospecting, bioethics, and traditional knowledge systems in the Andean Community region. His work contributes to the development of the biocultural approach as a framework for the recognition of Indigenous knowledge systems and the rights of Indigenous and Afro-descendant peoples in contemporary politic and governance. Dr. Nemogá enjoys working with students committed to pursue their own intellectual curiosity, to explore new ways of understanding and to achieve their academic and professional goals with high academic and ethical standards. Research Interests: Biodiversity Law, Indigenous knowledge systems, research and policy on genetic resources, natural resources and development, Indigenous education, Indigenous research methodologies. Nemogá-Soto, G.R. (in press). “Diversidad biocultural: innovando en investigación para la conservación/Biocultural Diversity: innovating in research and conservation” Acta Biológica Colombiana. Nemogá-Soto, G.R. (in press)) “Limitada Protección de la Diversidad Biocultural de la Nación/Limited protection of National Biocultural Diversity” Memorias, X Encuentro Constitucional por la Tierra. Bogotá: Corte Constitucional. Nemogá-Soto, G.R. (in press) “Los recursos genéticos y los conocimientos tradicionales en el Protocolo de Nagoya y el Convenio de Diversidad Biológica/ Genetic Resources and Traditional Knowledge in the Nagoya Protocol and the Convention on Biological Diversity” Seminario Internacional de Propiedad Intelectual, Conocimientos Tradicionales y Recursos Genéticos. Universidad ESAN. Lima, Perú. Nemogá-Soto, G.R. (2015) “Biodiversity Research and Conservation in Colombia (1990-2010): the marginalization of Indigenous peoples’ rights.” Canadian Journal of Latin American and Caribbean Studies. 39:1, 94-111. Nemogá-Soto, G. R & Cabrera Jorge. (2014). Commercialization of Biodiversity: market for genetic resources and biochemical components. In: M. Rios and A. Mora (Eds. ), Access to Genetic Resources in Latin America and the Caribbean: Research, Commercialization and Indigenous Worldview. UICN-PNUMA/GEF-ABS-LAC. Quito, Ecuador. Pp. 43-78. Nemogá-Soto, G.R. (2013). Investigación Genética y Políticas sobre Biodiversidad: escenarios para el reconocimiento de la diversidad étnica y cultural (Genetic Research and Policy on Biodiversity: spaces for the acknowledgment of the ethnic and cultural diversity). Colección Libros Resultados de Investigación. Serie Mayor, No, 2. Bogotá: Ibañez Editores. Nemogá-Soto, G. R. and Lizarazo O. (2013). Estudio de Caso en Ecuador “Expedición de Muestreo Oceánica Global”, Parque Nacional Galápagos: actividades de colección y aplicación de legislación. (Study case in Ecuador: "Global Ocean Sampling Expedition" Galapagos National Park: collection activities and implementation of legislation.) En: M Rios and A. Mora (Eds. ), Seis estudios de caso en América Latina ye l Caribe: acceso a recursos genéticos y distribución de beneficios. UICN-PNUMA/GEF-ABS-LAC. Quito, Ecuador. Pp. 77-88. Nemogá-Soto, G. R., & Vargas, I. D. 2010. Contratos de Acceso a Recursos Genéticos: Un análisis comparado (Contracts Access to genetic resources). Revista Pensamiento Jurídico, 27, 157-202. Nemogá-Soto, G. R., Ávila-Sánchez, L. A., Blanco-Martinez, J. T., Chaparro-Giraldo, A., Jimenez-Ariza, O. F., Lizarazo-Cortes, O. A., et.al. (2010). La investigación sobre biodiversidad en Colombia. (Research on biodiversity in Colombia). Bogotá: Universidad Nacional de Colombia and Instituto de Genética. Nemogá-Soto, G. R., & Rojas-Díaz, D. A. (2013). Propuesta para la solución al problema de acceso a recursos biogenéticos en Colombia (Proposal for solving the problema to access to biogenétic resources in Colombia) In Victor Vera (Ed.) La Biología Molecular en las Ciencias Pecuarias. Bogotá. Universidad Nacional de Colombia. Editorial Académica Española. Nemogá-Soto, G. R. (2010). Tejedores de vida: Revitalizing Indigenous identity and nature-based knowledge in a Muisca community, Colombia.In L. Maffi & E. Woodley, Biocultural Diversity Conservation: A Global SourcebookLondon: Earthscan. pp. 103-106. Keynote speaker “Indigenous Education: Lessons from Cauca-Colombia. Canadian Association for Latin American and Caribbean Studies’ 2015 Congress. San José, Costa Rica. July, 2015. Oral presentation “Constitución Colombiana y Límite a la Protección de la Diversidad Biocultural/ Colombian Constitution and Limitationes to the Protection of Biocultural Diversity” 10º. Congreso de la Jurisdicción Constitucional. Corte Constitucional de Colombia. Ibagué, Colombia. September 2014. Oral presentation “Los recursos genéticos y los conocimientos tradicionales en el Protocolo de Nagoya y el Convenio de Diversidad Biológica/ Genetic resources and traditional knowledge at Nagoya Protocol and the Convention on Biological Diversity.” Seminario Internacional de Propiedad Intelectual, Conocimientos Tradicionales y Recursos Genéticos. Universidad ESAN. Lima, Perú. November 2014. Presenter "The Nagoya Protocol and its main Elements” at the Workshop on Access and Benefit-Sharing in Latin America and the Caribbean: A science-policy dialogue for non-commercial, academic research.” Organized by DIVERSITAS, ICSU Regional Office for Latin America and the Caribbean (ROLAC), the Natural Science Suisse Academy (SCNAT) and the International Union of Biological Sciences (IUBS) and the University of Bonn. Lima, November 2013. Symposium Coordinator. Diversidad Biocultural: una apuesta necesaria. Pontificia Universidad Javeriana. Bogotá-Colombia. October, 2103. Presenter “Necesidad de las cosmovisiones indígenas para la protección del conocimiento tradicional.” Symposium “Diversidad Biocultural: una apuesta necesaria”, IV Colombian Congress of Ethnobiology. Bogotá-Colombia. October 2013. Paper presentation “The struggle of Indigenous Peoples in Colombia for achieving their living well worldview/ La lucha de los pueblos indígenas en Colombia para alcanzar su cosmovisión del Buen Vivir”. Panel “Exploring Suma Qamaña: Pan-Indigenous Conceptions of the Mother Earth, Development, and Sustainability” 7th Congress of the Association for Bolivian Studies. Sucre, Bolivia. August, 1 of 2013. Discussant, Presenter and Facilitator “Protocolos Bioculturales en el marco de Planes de Vida/ Biocultural protocols in the framework of community life planning”, Iniciativa para la Conservación en la Amazonia Andina – ICAA International Resources Group Ltd. –IRG. Lima, Peru, July 16 - 17 of 2013. Discussant. Core Team. Research Project on Access and Benefit Sharing (ABS) and the Nagoya Protocol. DIVERSITAS, the International Council for Science's Regional Office for Latin America and the Caribbean (ICSU ROLAC) and the Swiss Academy of Sciences (SCNAT). Montevideo, Uruguay, June 11-12 of 2013. Paper presentation “La educación indígena universitaria en Colombia/ University Indigenous Education in Colombia.” Panel “Indigenous Education en América Latina: Diálogos Hemisféricos” Conference of the Canadian Association for Latin American and Caribbean Studies (CALACS), Travelling knowledges peoples solidarities. Ottawa, Ontario May 3, 2013. University of Carleton. Oral presentation. “Investigación sobre biodiversidad en territorios colectivos de pueblos indígenas y comunidades negras y raizales /Biodiversity research on collective territories of indigenous peoples and black and raizales comunities”. Forum. “Régimen de acceso a recursos genéticos, investigadores y centros de investigación en diversidad biológica/“Access regime to genetic resources: researchers and research centers on biodiversity”. Research Group on Policy and Legislation on Biodiversity, Genetic Resources and Traditional Knowledge (PLEBIO). Bogotá, Colombia April 30 2013. Oral presentation. “Investigación en diversidad biogenética: una actividad de riesgo en Colombia?/ Research on Biogenetic diverstity: a risk activity in Colombia?”. Acuario Nacional Habana, Cuba. Marzo 21, 2013. Oral presentation: Bioprospection and Biopiracy cases. Workshop on Access and Benefit Sharing. Second Meeting Regional Project. Project GEF ABS LAC. Strengthening Access Regime to Genetic Resources and Benefit Sharing in Latin America and the Caribbean. Havana, Cuba. Marzo 22 de 2013. Oral Presentation. Biodiversity conservation and research in Colombia (1990 – 2010): Overriding Indigenous peoples' rights. At the 2012 Conference of the Canadian Association for Latin American and Caribbean Studies (CALACS), Kelowna, British Columbia, Canada. 2012. Oral Presentation. Biocultural research: Bridging different knowledge systems. At the International Conference Biodiversity and the UN Millennium Development Goals: Challenges for Research and Action . Frankfurt, Germany. 2012. Oral Presentation. Ethical and legal dilemmas regarding BioBanks for human genetic data & Environmental bioethics and biodiversity. At the 3rd International Congress on Bioethics of the UNESCO. Bogotá, Colombia: Bioethics Network for Latin America and the Caribbean. 2010. Thesis: Exploring Drumming/Song and its Relationship to Healing in the Lives of Indigenous Women Living in the City of Winnipeg.